“The blood of the martyrs is the seed of the Church.” At least that is how the early Christian writer Tertullian saw it at the end of the second century A.D. And the history of the early Church bears out his observation. It is impossible to know the exact figures today, of course, but we can been sure that the number of Christians increased dramatically in the first three centuries, from a few dozen believers that first Easter to several million by the time the Roman emperor Constantine declared Christianity a legal religion in the year 313. This exponential growth took place under the most adverse possible conditions. Christianity was illegal for the first two hundred and eighty years of its existence. Believers were constantly subject to harassment by their non-Christian neighbors, arrest by the Roman authorities, and forfeiture of property in the courts. If one of your pagan neighbors took a dislike to you and informed the officials of your unusual religious beliefs, public execution might follow if you refused to recant and return to the worship of the traditional gods. Cursing the name of Christ and offering incense to the genius of the emperor could be your only hope to escape the wild beasts, the headsman’s sword, or burning at the stake. Even though things could be relatively quiet for a few years at a time, there were repeated periods of intense persecution by the Roman state in which thousands perished and many more were maimed, imprisoned or impoverished. And yet the early Church flourished and grew under these terrible conditions. Indeed, the most rapid growth in membership frequently came immediately following the harshest periods of persecution. It is clear that many of the pagans who watched the horrific public execution of Christians were positively impressed by the conduct of the condemned, much to the chagrin of Roman officials! They asked themselves what these Christians could possibly know that made them willing to suffer torture and death rather than give up their belief in a crucified Jewish carpenter? What those early Christians knew, of course, is what our Scripture lessons remind us of this morning. In the first place, those early martyrs knew that God is the Judge of human hearts and that our actions on earth have eternal consequences. For as Isaiah prophesied, the day is coming when God will “make justice the line, and righteousness the plummet; and [His] hail will sweep away the refuge of lies, and waters will overwhelm the shelter"” of those who scoff at His decrees. The nations who rage in defense of this present world will be shaken, the Psalmist tells us, when “He utters his voice, [and] the earth melts away.” Therefore “See that you do not refuse the one who is speaking;” Hebrews warns us, “ for … how will we escape if we reject the one who warns from heaven!” We can be certain the early martyrs had the judgment of God in mind as they faced theirs executioners because they spoke to their persecutors about it repeatedly. 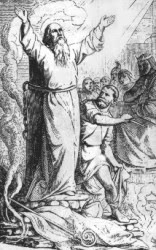 The aged bishop Polycarp of Smyrna, for example, admonished his Roman killers even as they tied him to the stake: “You threaten that fire which burns for a season and after a little while is quenched, for you are ignorant of the fire of the future judgment and eternal punishment, which is reserved for the ungodly.” What we do in this life truly does echo in eternity. Christians lived as if this life was merely a prelude to what was to come, and the death of every martyr graphically reminded their pagan neighbors that the things of this present world were passing away. Prepare for the next. But as we read the stories of the early martyrs we find it was not primarily the fear of Hell that kept them faithful to Christ even in the face of an agonizing death. Rather, it was the hope of a new and vastly superior world awaiting them. These early Christians longed to be part of “the assembly of the firstborn who are enrolled in heaven,” to join “the spirits of the righteous made perfect” in “the city of the living God, the heavenly Jerusalem.” Those early witnesses, who gave the last full measure of devotion for their Lord, knew they could remain faithful and “enter by the narrow door” only by reliance on the power of the Lord God of hosts, standing firmly on “ a tested stone, a precious cornerstone, a sure foundation” the Father has laid in Zion—our Savior Jesus Christ. We gather tonight to celebrate the life and ministry of St. Mary the Virgin, the Mother of our Lord. Our Lady’s entry into heavenly bliss at the end of her earthly life has long been commemorated on the fifteenth day of August. But while there is a great deal one might say regarding the Virgin’s present life in blessedness, this evening I choose to focus on the example she has left us in her earthly life. For from her first appearance in the Biblical narrative to her last—that is, from the Annunciation of Christ’s birth to the days just after the Lord’s Ascension—the Virgin Mary sets the standard of faithful obedience to God’s will. This is the context in which the familiar words of the great Magnificat find their fullest expression. So let’s turn our attention to the very beginning of Mary’s story in Holy Scripture. The Annuciation is one of the most depicted historical events in western art. Many of you are no doubt familiar with Fra Angelico’s famous fifteenth-century altarpieces, for example, which are typical of many medieval and Renaissance representations. In these masterpieces we find the blessed Virgin, clad in sumptuous blue and white robes trimmed in gold, wearing a golden diadem in her hair and sitting under a classical arcade in the middle of a luxurious, though well-tended garden. There is often a naked, crying couple in the background, fruit scattered at their feet. The archangel Gabriel genuflects at the Virgin’s feet, paying courtly courtesy to the one who will soon become the Mother of the Lord of all Creation. It is a beautiful and moving image, no doubt. It need not trouble us that the Bible makes no mention of the announcement happening in a garden, or that young women in a back-water village like Nazareth probably had never even seen fancy robes, gold jewelry or Greco-Roman architecture such as those painted by Fra Angelico. These details were added to underscore theological points for medieval Christian viewers. The fact that Mary sits in the midst of a garden, for instance, reminds us that she is the “second Eve.” The first Eve’s disobedience—explicitly portrayed in the background—took place in a garden. That is what set us all on the road to decay and death. It is therefore only proper that the faithful obedience of the second Eve be shown taking place in a Nazarene garden. The well-appointed classical portico reminds us that our God is a God of order, not chaos. And the beautiful robes and gold the maiden wears do not mean that she was from a family rich in earthly terms, but that she is of royal blood—the line of King David—and that she will one day become the “Queen Mother” of all Creation when her Son assumes His messianic throne at the cross. As a small town, Jewish peasant girl she is not worthy of much notice. But as the favored Mother of God-made-flesh archangels fall down at her feet. 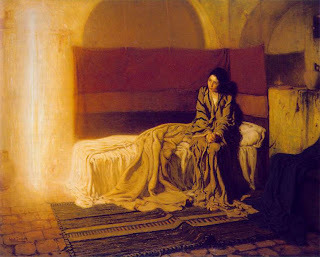 But I must confess, as beautiful as these medieval images are, my favorite painting of the Annunciation is a nineteenth century depiction by Henry Ossawa Turner. In Turner’s image St. Mary is shown sitting on her bed, little more than a cot in a mud brick house. The scene is homey and intimate. The teenager is wrapped in a homespun cloth nightgown and looks as if she is has been interrupted in the midst of her bedtime prayers. Instead of looking serenely on a regal angelic being in human form here Mary is gazing in wonder at an intense white light. The expression on her face is one of puzzlement, mixed with more than a little fear. “How can this be?” we can practically hear her ask the unseen messenger of God. As the blessed Virgin enters the Biblical picture she therefore sets the pattern of faithful obedience for us. Her submission to God’s will is grounded in deep reflection upon God’s Word and upon prayer. And Mary departs from the Biblical narrative the same way she enters it. In the first chapter of the Acts of the Apostles we learn that St. Mary remained with the eleven apostles in the Upper Room in the days immediately following our Lord’s Ascension. There it is said, “All these with one accord were devoting themselves to prayer.” The blessed Virgin’s final Biblical witness to us is thus also one of prayer, but in this case it is specifically prayer within the Body of Christ, prayer in the midst of the apostolic company. Of course, St. Mary has more reason to boast of spiritual discernment than any person who ever lived. After all, the Word of God had literally lived inside her for nine months. Yet Mary is not a spiritual “lone ranger.” She prays with the Church in the midst of the Church, in one accord with those whom our Lord chose to take the Gospel to the ends of the earth. And the result of Mary’s prayerful meditation on God’s Word and her unconditional submission to God’s will is that all generations will call this humble maidservant of the Lord “blessed.” And the Father wishes for all those who have become His children through faith in His Son to share in the bliss that our Lady now enjoys beside the throne of Glory. It is therefore incumbent upon us all to heed her example. Our own souls cannot magnify God our Savior in the way He deserves until we, too, open our hearts to be filled with God’s grace, until we ponder His holy Word in our hearts in accord with Christ's Church on earth just as she did. Amen. Delivered at St. Laurence Episcopal Church, Southlake, Texas, on August 12, 2007. The Scripture readings were those for Sunday, the collect and preface those for the blessed Roman martyr. The story of the martyrdom of Saint Laurence of Rome is, no doubt, well known to almost everyone here. So I hesitated to retell it this morning. But as I reflected on today’s Scripture lessons, I realized that they suit the details of Laurence’s passion beautifully. I simply cannot pass up this opportunity to highlight them. For you have a remarkable patron, my brothers and sisters. Your holy martyr’s witness to the true treasures of the Kingdom of God shines like a beacon in our own day as surely as it did in his, and few have demonstrated the unchangeable truths of today’s lessons from Holy Scripture as ably as St. Laurence did in the face of certain death. The earliest sources we have for the martyrdom of Laurence date from around the year 400 A.D. and come from the pens of St. Ambrose of Milan and Prudentius of Cordoba, Spain. These authors tell of a great persecution of the Roman church under the pagan emperor Valerian in the year 258. Bishop Sixtus of Rome and four of his deacons were seized and, apparently, crucified as traitors against the Empire. Somehow Deacon Laurence escaped arrest in this first sweep, but three days later he was rounded up as well. The Roman judge, upon learning that Laurence was in charge of the almost legendary charitable giving of the Christian community, demanded that the deacon present a full accounting of the Church’s valuables so that they might be confiscated. Surprisingly, blessed Laurence agreed to do precisely as commanded, telling the judge, “Our church is very rich. I must confess that it has wealth; our treasuries are filled with a gold not found elsewhere in all the world.” Laurence, therefore, was released and given three days to gather up the Church’s treasure, estimate its total worth, and present it to the court. St. Laurence had, of course, signed his own death warrant. Roman prefects were not men to be trifled with, particularly when money and good order were at issue. Three days later the deacon perished upon the gridiron. But by his actions the blessed martyr makes clear--as few in the years since have--the significance behind the words we heard a few minutes ago from the letter to the Hebrews and from our Lord Jesus in the Gospel lesson. The heavenly treasure of human souls that Laurence presented to the Roman magistrate cannot be bettered for highlighting the contrast between the values of God’s Kingdom and the values of this fallen world. "Do not be afraid, little flock,” Christ said to his disciples, “for it is your Father's good pleasure to give you the kingdom. Sell your possessions, and give alms. Make purses for yourselves that do not wear out, an unfailing treasure in heaven, where no thief comes near and no moth destroys. For where your treasure is, there your heart will be also.” Here our Lord gives us an ethic for people who long for what St. Laurence called our “celestial fatherland.” Jesus wishes us to unburden ourselves of those things that tie us down to this world of corruption and decay. For this present world, tainted by sin and death, is not our true home if we are people of faith like our forefather Abraham. Remember Abraham and the other righteous people described in the eleventh chapter of Hebrews, who “confessed that they were strangers and foreigners on the earth, for people who speak in this way make it clear that they are seeking a homeland. … They desired a better country … a heavenly one. Therefore God is not ashamed to be called their God; indeed, he has prepared a city for them.” That is the heavenly city where you and I are meant to put down roots one day, if our belief in God’s promise of redemption is “reckoned to us as righteousness,” as was Abraham’s, and we do not cling to a world that is passing away and succumb to its values. It is, after all, our Father’s good pleasure to give us the Kingdom. But note what are we to do with the proceeds when we sell our possessions: Jesus tells us to “give alms.” We are therefore commanded to turn away from the transient things of this age and invest in things of eternal significance—in the only creatures in the Universe whose immortal souls bear the image and likeness of the Living God, our fellow human beings. That is precisely what blessed Laurence was saying to the Roman judge. The treasures we Christians store up for ourselves in Heaven are not streets of gold or fancy mansions, for God is going to give those to us anyway! No, the heavenly treasure we accumulate is each other. Every time you and I do something to help one of God’s little ones flourish and grow His love and service, particularly those least able to help themselves, we are serving in the treasure rooms of Heaven, lamps lit and girded for action, waiting for our Master to return. And every time we foster someone’s faith in Christ our Savior we are adding to our Lord’s wondrous treasure. God does not wish for His riches to bear no return. For the children of faith are meant to be “as many as the stars of heaven and as the innumerable grains of sand by the seashore." The blood of martyrs like Laurence of Rome added myriads of souls to the treasury of Heaven in the ancient world. It is our turn to add to that divine abundance. So let us have St. Laurence’s lesson to his Roman judge in mind as we come forward to renew God’s gift of life within us through Christ’s precious Body and Blood. Like the Christians of the third-century Roman church we, too, were bought with a price beyond imagining. We kneel together before the altar, joined in our praises by blessed Laurence and all the company of heaven, representing a tiny portion of “the wondrous treasure of our God.” But the fullness of our worth will not be seen until we, in the blessed martyr’s words, “shine resplendent with new life in [our] celestial fatherland.” Laurence and those for whom he cared in this world shine like that now. May God give us the grace to hold lightly to the things of this world, caring only for the wondrous treasures of our God around us, following the example of the blessed martyr of Rome. Amen. I don't typically put a great deal of personal news on this blog, but I feel compelled to share two recent developments with you, dear Reader, in hopes of garnering your prayers. First, my mother, Hazel Foster, has had two strokes within the last week, and she is now largely paralyzed on her left side. I would be most grateful for your prayers for her well-being and healing, as well as for strength and courage for my father, Randy, who is having trouble coping with her present impairment after sixty-two years of marriage. The second bit of news is happier. Today I received official word from the Rt. Rev. Jack Leo Iker, bishop of Fort Worth, that I will be ordained (God willing) to the Sacred Order of Priests by him at St. Vincent's Cathedral Church in Bedford on the Feast of the Holy Cross, Friday, September 14th, at 7 O'Clock in the evening. Your prayers, and your presence if possible, would also be most deeply appreciated. The final press conference for the Network council has been posted on-line by Anglican TV.